Sony KD-65X9005C review | What Hi-Fi? The Sony KD65X9005C is a ridiculously thin 4K television. We’re not talking a little slimmer than others – Sony says this is the slimmest model in the world. ‘Ultra slim’ Sony calls it, and we are inclined to agree. Its 4.9mm-thick top half is thinner than any smartphone we’ve seen. Its bottom half, at 3.9cm, is a hair thinner than four stacked bars of Kit Kat. Sony has achieved this by tweaking the LCD panel’s construction and combining it with a special edge-coating technology, which helps keep the screen slim while retaining its rigidity. We have mixed feelings about this. On one hand, this TV possesses the ethereal beauty you would expect to see in a sci-fi film. Then again, it fills us with fear that we may accidentally snap it. Just like a Kit Kat. Why is it so thin? Because Sony can, and because they really want you to wall mount it. You can attach feet to prop the thing up, but really this TV is dedicated to those who aspire to the whole showroom thing in their homes. It even ships with a special wall mount bracket, which hangs the TV like a painting, flush against the wall, but lets you swing it forwards a little to access the plugs at the back: four HDMI inputs, three USB ports, digital optical, ethernet and a smattering of legacy connections, as well as aerial and satellite inputs. At the heart of the X90C lies Sony’s X1 4K picture engine, which is in charge of analysing and optimising the picture’s colour, contrast and clarity. A Super Resolution algorithm in the processor compares images to an internal database to upscale non-4K images. Triluminos technology, meanwhile, promises a wider and more realistic colour palette. Does it all work? Yes and no. Picture performance is a mixed bag of pleasant surprises and crushing disappointments. Let’s start with the good. This Sony is good with its colours. Whether you watch 4K on Netflix, Full HD on Blu-ray or standard-definition broadcast, you’ll get a well-judged palette. There’s plenty of visual kick to grab your attention, yet enough restraint to appear natural. The hues are dynamic enough to seem lifelike. Skin tones are particularly convincing. The picture is an insightful one. It’s sharp in 4K, with solid detail afforded to distant foliage and close-up frowns alike. Textures are not quite as crisply defined as the Samsung UE65JU7000 but it’s still a significant step above Full HD. Speaking of which, this Sony is a proficient upscaler. We spin a Blu-ray of Jurassic World and the definition offered is excellent, especially considering the TV is making up three-quarters of the picture. Chris Pratt’s stubble looks suitably prickly. The raptor’s teeth look dangerously sharp, even though they are mostly CGI. It’s all solidly drawn without seeming overly processed, and not once did we wish for native 4K instead. Motion is fine too, as long as you activate the Motion Flow setting. Turning it off introduces a degree of judder, but the presets are a little zealous and glossy. We’d recommend setting it on ‘custom’ and then manually putting it a notch above minimum. That way motion is steady, even during slow pans, without noticeable tearing or other distracting artefacts. Time for the bad news, and the backlighting which has us hugely distracted. On our review sample it is uneven, with a remarkable amount of light bleed at the edges of the screen. Watch anything with black bars top and bottom (the majority of films and TV shows) and it becomes obvious that this is an edge-lit display. It’s not even an even bleed, where the areas near the edges are all a little brighter. The word ‘patchy’ springs to mind. That’s on top of this set’s inability to deal with darkness. A lack of contrast makes dark scenes look either flat or washed out. The set struggles to go properly black. Details in the shadows are inconspicuous. Contrast isn’t so much an issue in bright scenes, where even the brightest whites have a degree of gradation. Bright whites play nicely with the dynamic colours, although dark areas like coats and hair remain a murky mess. Sadly, the sound is also poor. There is no escaping what can be charitably described as a thin presentation. It’s never shrill or hard, but it is tiring after a while. It badly needs some weight and much wider more expressive dynamics. The smart interface makes a decent attempt at making amends. Sony TVs this year use Google’s Android TV operating system. It’s neat and attractive, with big blocks of colour. It’s a little slow, however, and its content offering is not the best we’ve seen. Besides the first-party staples of Google Play Movies and Music, the highlights are Amazon Video and Netflix. There’s a lot of ‘miscellaneous’, such as the ‘Peaceful Fireplace HD’ app, however the recent integration of YouView, brings all of the UK’s main catch-up apps to the party. 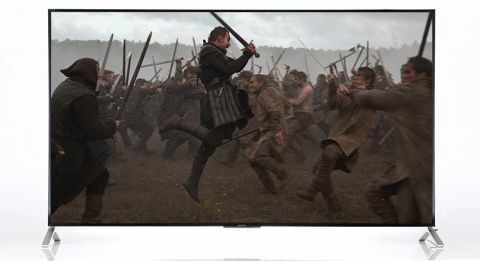 For the money, the Sony KD65X9005 is a decent TV. It does well in some key areas, but it is certainly flawed – look elsewhere if you’re after the best performance at this price. However, if you’re after one of the thinnest TVs in existence, this may do the job.